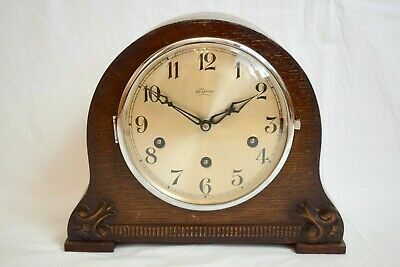 Compact SCHATZ mantel clock with time strike. Unsold EUR 25,37 0 Bids, EUR 23,22 Shipping, Pay with PayPal and you're fully protected. 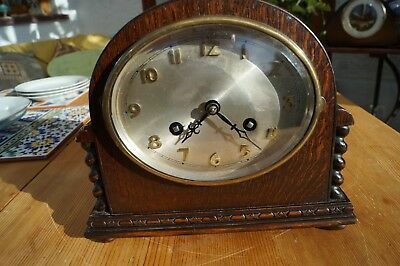 Seller: yyppiz (2.574) 100%, Location: cwmbran, Torfaen, Ships to: GB & many other countries, Item: 173868125964 This is an early Schatz striking mantel clock bearing the two elephants logo as in pics. Complete with key and pendulum. Fully functioning. Strike counts the hours on a coiled gong. One strike on the halves.Oak finish with barley twist columns. Approx 8" wide x 9" high x 5" deep. Oval dial with raised numbers. 1940's at a guess. All clean and sound as in pics.You may need to re-set the pendulum following transit.